If you have been following SoCal City Kids for awhile, you know we are big fans of the Aldo Zelnick Comic Novels. I like them because they make me think of a smarter and more creative Wimpy Kid. My son laughs out loud when he reads them and every time we get one to review, it is quickly read. Usually we read them together at story time but this time my son read it before we had the chance to do that. He likes these books a great deal! We were both excited to see a couple of the books in our local library. Now, back to the latest book! Jackpot does not disappoint! It is funny, imaginative and makes you laugh. 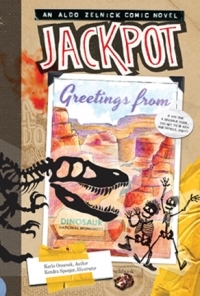 Jack and Aldo find a Dino Fossil in this story. Is it just a rock or is it a fossil? Will they become rich and famous? Most of all, will they be able to keep it from their friend Bee, who has discovered Journalism? This is a really fun book! Kids will love it especially if they are into dinosaurs and fossils! We give this book a thumbs up! I honestly think that the Aldo Zelnick books just keep getting better and better! Check out the Aldo Zelnick website! It’s a really fun site for kids! Self Disclosure: We received a free book to facilitate this feature.